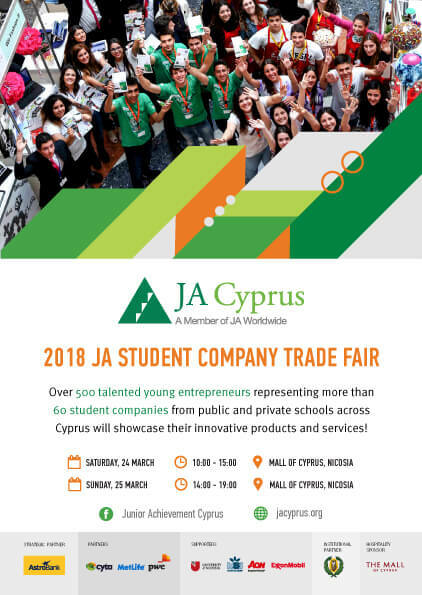 Over 420 Young Entrepreneurs showcase their Student Companies during a 2-day Trade Fair organized by Junior Achievement Cyprus for the fourth time. The Trade Fair will take place on Saturday, 24 March (11:00-15:00) and on Sunday, 25 March (15:00-19:00) at The Mall of Cyprus, Nicosia. The event will be open to The Mall of Cyprus visitors and anyone interested in discovering the entrepreneurial spirit of Cypriot youth.